You know that mental list of things that you really really want for your home and have done for years but still haven't got? I'm not talking about the 'fantasy' list of things that you're probably never going to own unless you win the lottery (well, let's be honest! ), but the more realistic things that you've just never quite been able to justify. Or is it just me who has both of those lists? I really hope not. Well as you've probably guessed, my list is quite long. Yes, I am greedy and I want a lot of things. I've decided that it could be worse - I'm not a bad person because of this, I just like pretty things in the house, and it makes me very happy. So sue me. I'm pretty excited today, because I'm now able to cross not one, but two of those items off my list, for today is the day that I opened up two very exciting boxes. And I have justified the life out of them below. 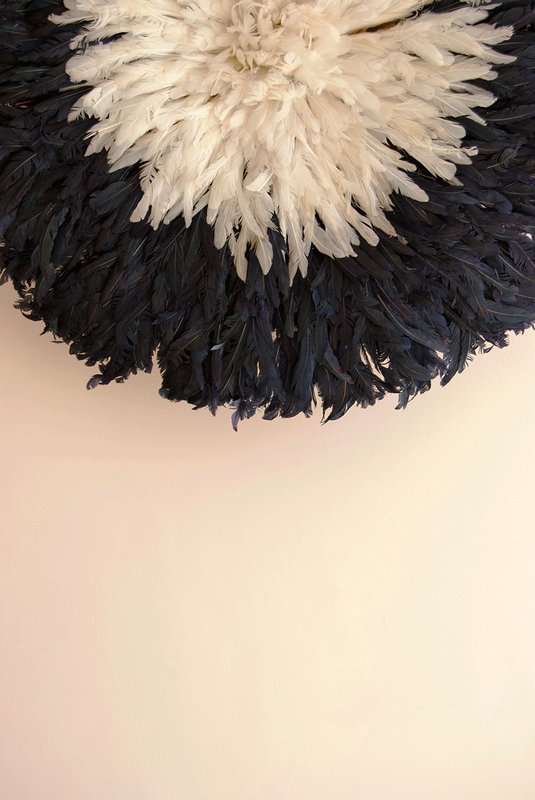 The first box contained a magnificent cream and black Juju hat. 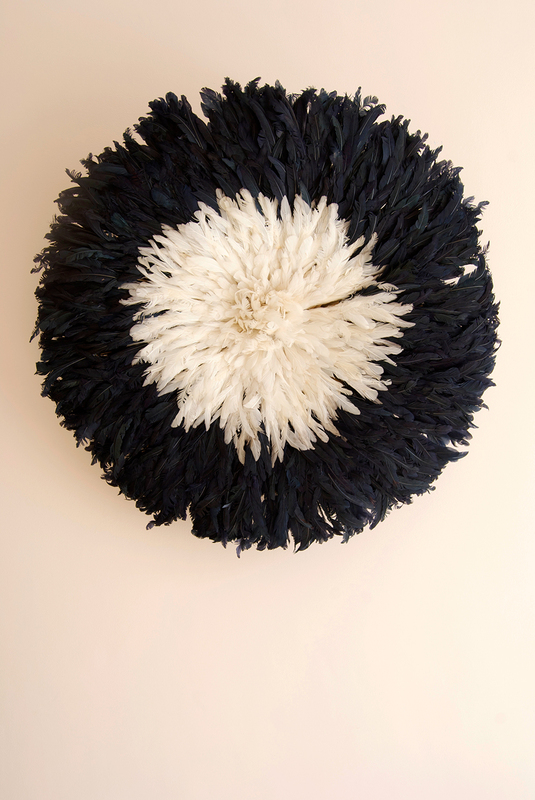 Handmade in Cameroon by local craftspeople and traditionally made as ceremonial head dresses, these insanely beautiful feathered artefacts have been gracing the walls of gorgeous homes world round for years now, and I've had one at the top of my really really want list for ages. Not really having ever felt I could justify the two hundred plus pound spend, I occasionally check ebay to see if any pop up, and that's exactly what I did the other night. BINGO. I picked one up for £80 from a lovely lady who was given it by friends living in Cameroon, but the colours didn't work in her house so she decided to sell it. No one else even bid on it and I'm over the moon at my bargain buy. Luckily I didn't have a choice colour wise, or I'd never have been able to choose as they come in an amazing array of colours, which has probably also contributed to the fact that I've not bought one before. However I do need to decide where to put it. 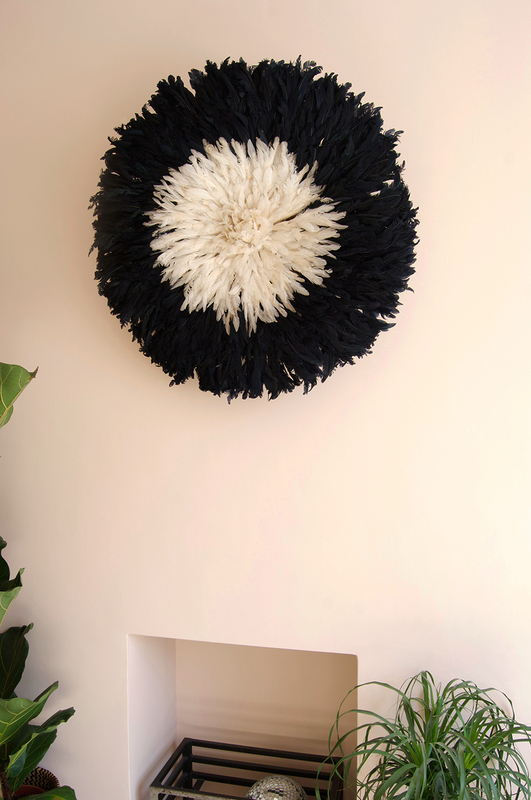 I temporarily popped in on the chimney breast to photograph it, but I don't think it will end up there. At around 80cms in diameter, it still get's a little lost there, or perhaps I'm just used the really big print that is normally in that spot. I'll let you know where it ends up. 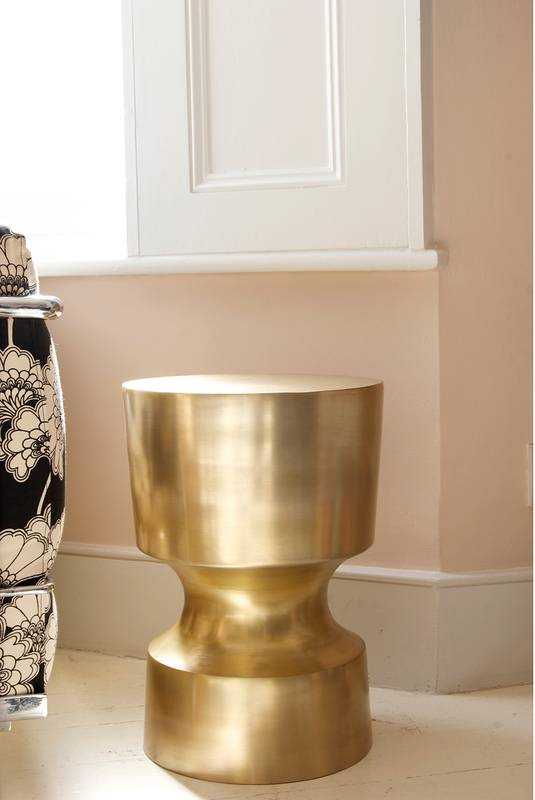 The other thing I've crossed off my list is this beautiful 'Tumbler' side table from West Elm in a brass finish. Admittedly it's not been on my list for years, and in fact this particular design is quite new, but our living room has been crying out for a couple of side tables for a long while, and I totally fell in love with the selection from West Elm when I first laid eyes on them. It was a case of nothing else will do. I decided to splash out and buy one (not two!) and I've found another wooden side table for £30 on eBay (of course) that I'll paint. So I've actually saved money there, right?! Oh, and while I have your attention, I've been nominated in the Best Newcomer category in the Amara Interior Blog Awards, and I'd very much appreciate your vote to help me get to the shortlist. If you enjoy my blog of course. Just click here, I promise it only takes a minute. One more thing, and then I'll let you go. This week is a pretty monumental week for me as my littlest who will be four next month started full time nursery (actually just yesterday), which means I finally have a bit more time to concentrate on the things I love doing, like writing my blog so I'll be posting more regularly. Hooray! So please come back soon or sign up to get posts in your inbox, because in the next few days I'll be sharing my recent holiday purchases and a mini interiors shopping guide to Ibiza and Formentera, and I have so many other exciting posts in the pipeline for you too! Now go vote.